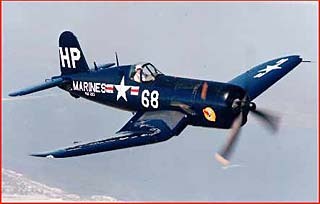 The CORSAIR - JMRC Flyers Club Newsletter - May 2001! 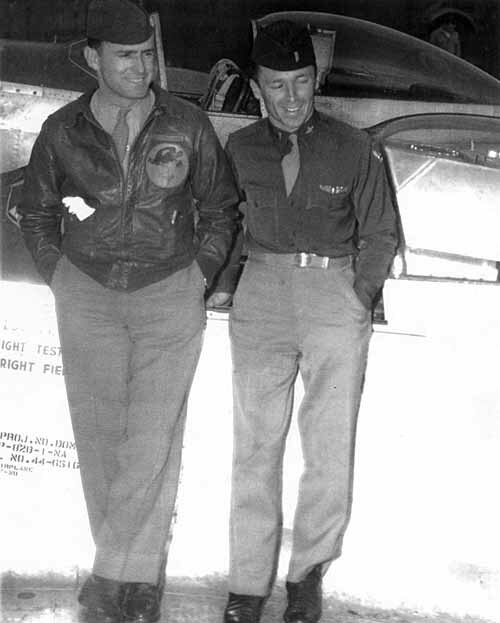 Col. Thacker, seen above on the left, standing on the wing of the F-82 "Betty Jo." Members and guests who attend the next Joint Military RC Flyers meeting are in for a rare treat, a program to be presented by Colonel Bob Thacker. 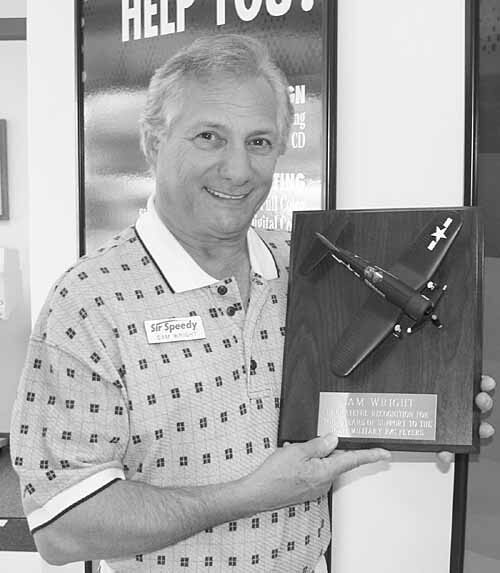 Not only is he among the most distinguished and respected members of our club, but he is the bearer of a world class reputation in the field of Military Aviation. Colonel Robert E. (Bob) Thacker enjoyed a long and exceptional career in the Air force from 1939 to 1970. He was one of the few officers to fly two complete combat tours in World War II; one against the Japanese and the other against the Germans. In the summer of 1945 he ran an accelerated service test of the P-80, first combat ready jet aircraft. 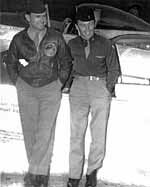 The program was assisted by then Captain Chuck Yeager. 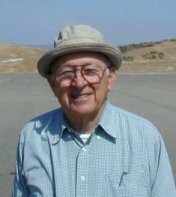 He participated in three wars: World War II flying B-17's, Korea flying B-29's and in Vietnam flying classified high altitude missions. 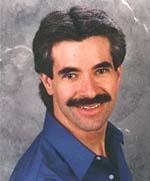 He is a graduate of the Air Force Test Pilot Academy, Edwards Air force Base, California. He was cited for valor against an armed enemy twice by being awarded two Silver Stars, ten Air Medals and many Theater and Battle Stars, plus the French Croix de Guerre with Palm. He also received three Distinguished Flying Crosses, one of which was for his flight of the "Betty Jo" (appropriately named for his beautiful wife). He flew the P-82 from Honolulu to New York in 1947 and set many records still standing. It was the longest non-stop fighter flight carrying the maximum weight for takeoff of a fighter, and set the speed record between Hawaii and New York. 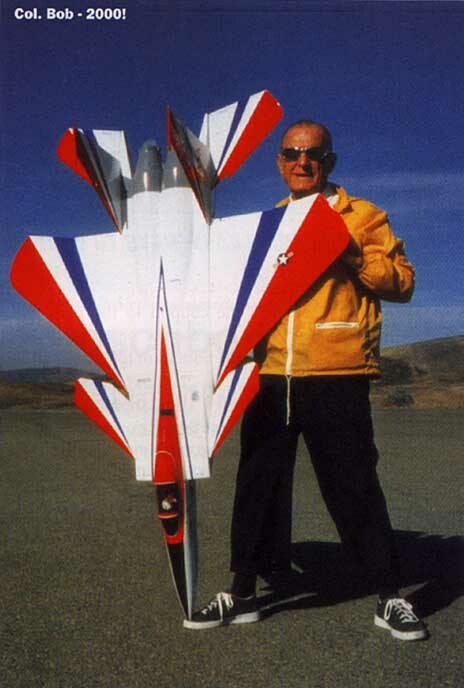 Colonel Thacker and Betty Jo presently live in San Clemente, California, where he is extremely active in aviation of all kinds, especially in the field of radio controlled model aircraft. His program will consist of the showing of a major network documentary featuring his outstanding career, after which the Colonel will open the floor to questions. It is recommended that every member make a special effort not to miss this exceptional program. Guests, especially spouses, are welcome, and all can be assured of a most entertaining and interesting experience. Club meeting begins at 2000 (8:00) with Model Of the Month presentation immediately following club business. There will be no raffle at this meeting. Pilots with propane powered aircraft MUST bring a fire extinguisher with them to the field. JMRC does NOT allow taxiing in the pits! Everyone must walk their aircraft in and out of the pits. Low fly-by’s are NOT allowed over the runway. No flying behind the flight line will be tolerated. Pilots need to stand closer to the center of the flight line when flying. When two or three pilots are airborne and one of them is standing way off on one end, he can’t communicate with the other pilots. The JMRC board doesn’t want to interfere with anyone’s enjoyment of the flying site, but safe flying is our #1 priority. During the past 60 days we have had quite a number of “no fly” days at LZ-53 either because of weather or because the LZ has been scheduled for use by the Marines. I must congratulate those JMRC members who have been making use of the facility since we seem to have had no problems with the procedures we established for the opening and closing of the field and we thank those who have been doing such a good job, their names being duly recorded in our field log book. caused by the closure of Orange county flying facilitiest. We have been allowing those who close the field on Saturday to leave the telephone line out overnight to simplify the closure operation as well as the opening the following Sunday Morning. You must however put the telephone instrument in the shelter, sign the log book and put away the frequency control box. Of course Sunday evening those closing must also store the phone line. Dennis covered the Hangar-9 kit with Sig Koverite and is powered by a MDG 1604S twin, pulling a 16-8 prop. As of the March meeting, the Cub hadn’t yet experienced it’s maiden flight. Clifford Weirick, 73 Born Oct. 27, 1927 in Wooster Ohio, he entered the U.S. Navy and worked on many ships, notably the USS Kersarge where he was responsible for missile security. After 22 years he left the Navy and worked locally for Kraft Systems in Vista as manager. He was an avid pilot and was a world champion in radio controlled competition. 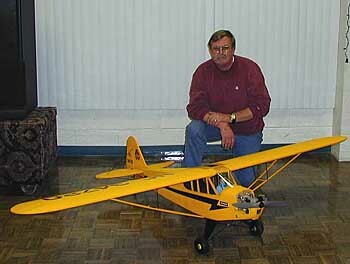 He built many scale models of aircraft in his home workshop, including a 1/2 scale F40 Corsair. "Cliffie" had a disabling stroke on Christmas day and on April 12, 2001, he flew west for the last time. He is loved and missed by many. A memorial service was held at 1 p.m. Tuesday, April 24, at Rosecrans Memorial Park in Point Loma. Sam Wright was presented with a plaque at the March meeting, in recognition of his many years of support to the JMRC. Here are Sam’s thoughts regarding the plaque and the club. "I wish to thank the members and the board of directors of the Joint Military R/C Flyers Club for the distinguished honor and plaque. You can rest assured it will reside in a prominent place in my office where I can view it daily. As a long time civilian member of the JMFC, I can say I have enjoyed every moment. See you on the flight line." Due to an oversight in the March Corsair, two extremely helpful people were not recognized for their contributions to the January JMRC Banquet. Virginia Teason (Dennis’ wife) performed the task of shopping for and wrapping the ladies door prizes. Virginia did an outstanding job with the task, and the prizes were greatly appreciated by all the ladies at the banquet. Art Steinberg had this beautiful cake created at a local bakery. It was a piece of edible art! Thank you both for your efforts in making the January 2001 JMRC Banquet a rousing success, and I apologize for not recognizing you in the March Corsair.